On these pages I have listed all the surviving colours and standards that were known 1901 when Rudolf Cederström's book "Svenska kungliga hufvudbanér samt fälttecken vid i Sverige, Finland and öfriga svenska provinser stående trupper" was published. I have followed Cederström's numbering of the colours and standards but not his detailed description of them. Instead I have when it is possible added a link to Digitalt Museum which has digitalised the content of Armémuseum's collections in Stockholm. Hopefully the large amount of Swedish colours in Copenhagen and S:t Petersburg will also be digitalised in the near future so that I can add links to them as well. Number 1 to 9 in Cederström book are royal banners which are supposed to exist in Armémuseum but I have been unable to find them in Digitalt Museum and because of that they are not included here. On the other hand I have added links to several colours which were not included in Cederström's book but now exist in Armémuseum's collections. These can be recognised by the fact that they are not numbered. Special pages have also been created for Finnish regiments, männing units and levy colours. The colours and standards belonging to these categories have redirecting links in green text where their numbers belong. 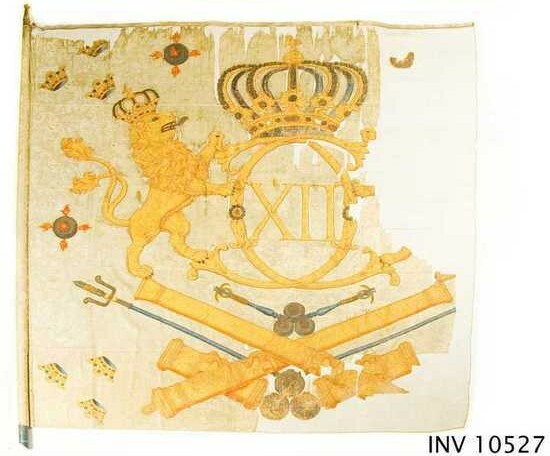 The colour shown on this page is the Artillery colour which was carried 1693-1718 (Cederström's number 1107).